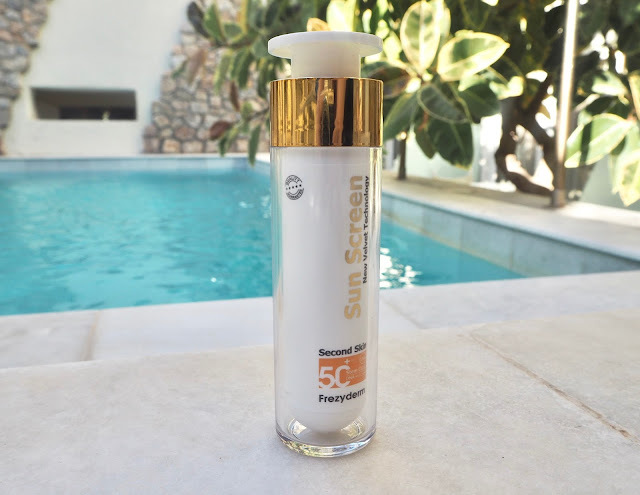 I had been on the hunt for a decent face suncream for a while, I tended to use regular suncream on my face when I went on holiday and my skin really disliked it. I knew this summer when I went away I needed something decent that would keep my skin in good condition and most importantly stop it getting burnt! I'd done a little research on which one to get when coincidentally the kind people at FrezyDerm gifted me their Sun Screen Velvet Face SPF*. FrezyDerm are a Greek brand that make endless products including sun screens, hair care, body care and children's products. Personally I hadn't heard of them before but I believe this is because they have only recently launched in the UK. As I was going on holiday to Greece this just seemed meant to be! So whats the deal with the Sun Screen Velvet? Well, it's £17.50 for 50ml and it comes in an SPF30 or an SPF50. I went for the SPF50 as I'm incredibly fair skinned and therefore burn very easily. The packaging is plastic (so no need to worry about it smashing in your suitcase!) and is primarily a white and transparent design with gold detailing. The pump dispenses just enough product for one use I find, so you don't end up wasting loads. It also locks really securely so you know you can chuck it in your beach bag, go out for the day and not worry about a suncream explosion going on in the depths of your bag. The product itself it not what I was expecting at all, I know it has 'velvet' in the title and that probably should have been a clue! It has a slightly yellowish tint to it but this doesn't transfer onto skin at all and appears completely clear. It's the texture of this stuff that I love the most, it sinks in super quick and dries down matte so you don't have a greasy looking face which lets be honest in the heat is exactly what you need. After wearing this for a few days I noticed that it wasn't clogging up my pores or causing me to break out like regular suncreams do, in fact my skin felt soft and looked fairly clear. This also doubles up as a good make up base, so before I went away to Greece I couldn't resist just testing it out anyway. Honestly, it creates the smoothest texture to apply your foundation and concealer to. I noticed a difference in the longevity of my make up when I had this on too, yes I still needed to powder once in a while depending on which foundation I was wearing but there was much less oil being produced and hanging about on my face. Overall this is a winner for me. 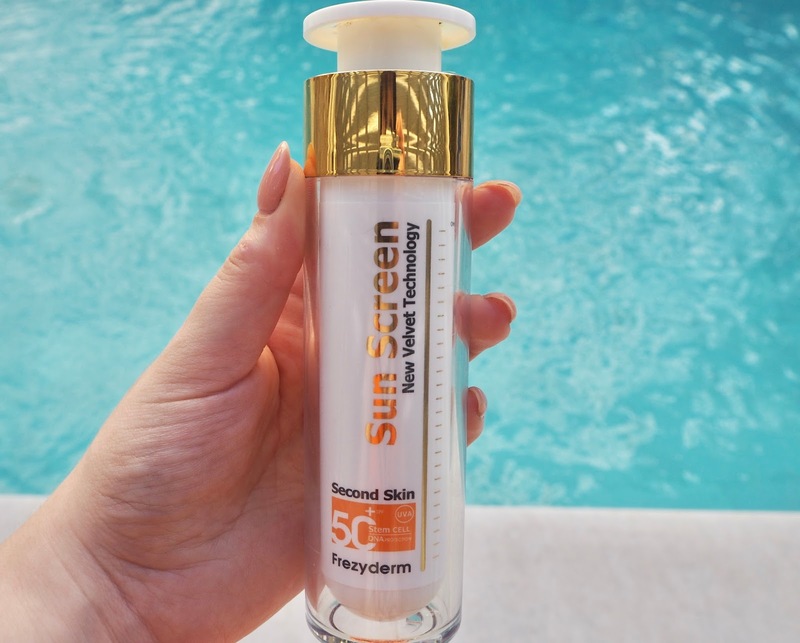 It kept my skin well and truly protected whilst out and about in the sun, it leaves a nice matte finish and as an added bonus it works well as a primer. I am very much looking forward to testing out some other products from FrezyDerm, as always, leave me a comment of any that you've tried. *to reiterate- I was gifted this product but all opinions are my own!